Using heat is one of the most effective ways to completely eliminate bed bugs and their eggs in just one treatment. A bed bug heat treatment is the ultimate solution to those who want to easily and quickly get rid of bed bugs. Our guaranteed heat treatments will kill all life stages of bed bugs, including any eggs. Within a minute of being exposed to the 150-degree heat, bed bugs will die. Bed bugs can’t stand the heat, and that’s what makes heat treatments so effective. To schedule a free in-home inspection/estimate, call (623) 888-8190 or Schedule Online. What Are Bed Bug Heat Treatments? How Do They Work? We use an advanced technology known as Thermal Remediation (heat treatment) to eliminate bed bugs. When bed bugs are exposed to air temperatures between 130 and 150 degrees, they will die within a minute. 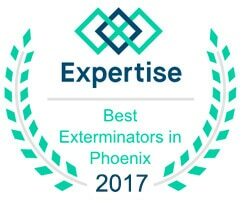 Efficient – Bed bugs are gone same day of treatment. Only one treatment required. 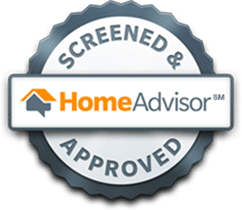 Our technicians been trained in a systematic, step-by-step process for treating your entire home. There’s not a single corner or crevice that will not be properly heated. We are committed to making the first time we treat your home the last. Depending on the size of your house and the number of rooms, our heat treatments can take anywhere from 2 to 8 hours. Once the bed bug heat treatment is complete, there will no longer be a living bed bug in your home. You are guaranteed with that peace of mind with our 1 Year Warranty. How Much Does a Bed Bug Heat Treatment Cost? When it comes to bed bugs, no job is the same. The cost depends on many different factors like the size of the home, the level/severity of the infestation, sizes of the rooms, amount of furniture, etc. 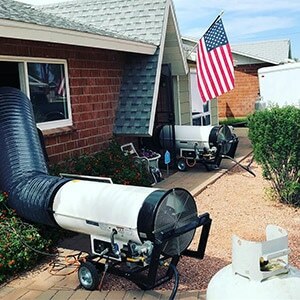 We would be more than happy to provide you with a free, no-obligation heat treatment estimate that is customized to your unique situation. To schedule your free estimate, call (623) 888-8190 or Schedule Estimate Online. We offer extremely affordable treatments that will fit just about any budget. 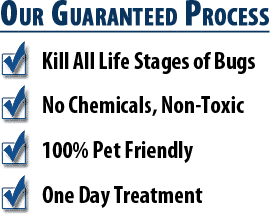 What is the Success Rate for Bed Bug Heat Treatments? When done by a professional exterminator that specializes in bed bugs, heat treatments will have a 100% success rate. Unlike some chemicals, bed bugs are not resistant to heat. All living bed bugs and eggs will be dead once they are exposed to the high level of heat from our heating equipment. Do You Offer a 100% Guarantee or Warranty? Yes, we do! We offer one of the best warranties in the industry. Our heat treatments are guaranteed for a year from the date of treatment. If you ever have bed bugs in your home within your warranty period, we will come back and retreat at no cost to you. We have zero tolerance for our customers being bitten even one more time.